What is the statute of limitations for filing a claim after my car accident? The “statute of limitations” is the time period under Nevada state law you have has to pursue a legal claim against a person or business for a specific act that caused you injury. Different types of legal claims may have different time periods. It is critical that you file a lawsuit within the applicable time limit, or you might not be able to pursue a claim for compensation at all. Two years from the date of the accident for personal injuries. Three years from the date of the accident for property damages. In some cases, the statute of limitations could be extended, or “tolled”. For example, if you did not experience any serious medical problems until long after the accident, it’s possible for the statute of limitations to be extended. In addition, exceptions are sometimes stated in statutes, but in other cases, the judge decides. Therefore, it is critical that you contact an experienced personal injury attorney who specializes in handling car accident claims to fully understand the time period for pursuing legal action. If you’ve been injured in a car accident, you should take action as soon as possible. A witness’ memory is fresher right after the accident, and evidence—such as surveillance tapes—could be destroyed, lost, or taped over if you don’t pursue a claim early enough. No matter how serious your injuries, we’re here to help you understand your legal options and fight to get you the compensation you could be entitled to. Contact us online or call us directly at 866.299.0558 to schedule your free consultation. If another driver was sleep deprived and caused an accident, is he or she responsible for my injuries? Suffering an injury as a result of a car accident is never a pleasant experience. Unfortunately, the effects of the accident may be made even worse depending on the severity of your injuries and property loss. If the other driver caused the accident, he or she may be liable for these damages. Sleep deprivation is sometimes the prime factor behind the cause of the car accident. Been more susceptible to feelings of stress, irritability, and aggressiveness, each of which can affect driving behavior. Had impaired judgment, making it more likely to drive faster than intended. Been less able to process and remember information. Felt less motivated to practice vigilance while driving. A copy of the police officer’s report from the accident showing a lack of signs of skid marks or other indications that the other driver was drowsy. Records from the driver’s workplace showing that he or she had recently completed a long shift, an overnight shift, or had worked many consecutive hours over the course of a short timeframe. Testimony from co-workers or classmates who were with the driver before the accident confirming that the driver was fatigued. Testimony from other drivers or passengers indicating the driver was swerving or displaying other driving behavior that supports a claim that the driver was tired at the time of the crash. If you were injured in a car accident caused by a drowsy driver, it is important to take action to protect your legal rights. We have helped many clients obtain the compensation that they deserve. We encourage you to review our client testimonials to learn more. I was injured in an accident and suffered a herniated disc. Am I entitled to compensation for the pain? Suffering a spinal injury after an accident can leave you experiencing significant pain. Herniated discs are no exception. A herniated disc occurs when the soft layer of the rubbery disc that lies between the vertebrae in the spine bulges through the tough exterior. Many victims experience significant pain that requires extensive and ongoing treatment. Fortunately, these victims may be entitled to compensation as a result. Do not try to deny the pain. Recognizing and acknowledging your pain is the first step towards developing an effective pain management and treatment plan. Many victims try to downplay or ignore their pain at first, which only delays the time before relief can be obtained. Do your best to manage your stress. Stress can intensify pain. Therefore, it is important to practice good stress management techniques such as deep breathing exercises. Learn to identify triggers of your pain. When you suffer from a herniated disc, you will often notice that you have certain triggers that initiate or intensify your pain. Learning to identify your specific triggers can help you to modify your lifestyle in order to avoid them. Seek counseling from a professional mental health counselor trained to deal with pain management. This counselor can provide you with an important source of support and understanding. You will learn how to rethink your expectations and adjust your feelings regarding your accident, your pain, and your resulting emotions. If you suffered a herniated disc as a result of an accident, it is important to take action in order to protect your legal rights. Time limitations apply to your ability to pursue a legal claim. We encourage you to contact us today at 866-299-0558 for a free consultation. I am suffering from skin pressure sores after a spinal cord injury, am I entitled to compensation? After a spinal cord injury, you may be left facing permanent or temporary paralysis in one or more areas of the body. In addition to the challenges that accompany paralysis comes the risk of suffering several types of potentially severe complications. One such example of a complication stemming from paralysis is the development of skin pressure sores, also known as decubitus ulcers or pressure ulcers. When these sores or ulcers develop, it is crucial that victims seek medical attention. If left untreated, these sores could result in serious infection, require surgery, and even be life threatening. During stage one, the skin is not broken, but it is red. The color does not fade after 30 seconds of pressure is removed from the area. Victims can generally treat the sore by staying off the affected area and maintaining proper hygiene. During stage two, the top layer of the skin is broken. The sore is shallow, but open, and drainage may be present. The wound must be cleansed and a dressing must be applied. During stage three, the skin has broken down into the second layer of skin and subcutaneous fat tissue. A doctor should be consulted for treatment. During stage four, the skin has broken down to the bone and muscle. At this stage, immediate medical attention is required. The victim may require surgery. Stage four skin pressure sores can be life threatening. Depending on the severity of your sores and the treatment required, you may be entitled to compensation for your suffering in addition to the compensation you receive relating to your paralysis. It is important to act quickly, however. We encourage you to contact us today for a free consultation at 866-299-0558. What happens if I am injured by an accident caused by another person’s hydroplaning vehicle? Driving in the rain may be a risky endeavor; however, there are many cases where it cannot be avoided. Unfortunately, even if you understand how to properly operate your vehicle under wet conditions, you may still find yourself involved in a crash. Another driver that hydroplanes while traveling alongside you may cause an accident. That driver may be responsible for your resulting injuries and property damage. Hydroplaning occurs when water causes the tires of a car to lose contact with the surface of a road. When tires lose contact with the road surface, the vehicle loses traction. As a result of the loss of traction, the driver is unable to brake or steer the vehicle. Hydroplaning is more likely to occur if a vehicle is traveling at a higher rate of speed. Hydroplaning is more likely to occur when there is a greater amount and flow of water on the roadway. Hydroplaning is more likely to occur when the vehicle’s tires are not in optimal condition. If you were struck by a hydroplaning vehicle and suffered damages as a result, it is important to act quickly in order to protect your legal rights. Time limitations apply to your ability to pursue a legal claim. We encourage you to contact us today for a free consultation at 866-299-0558. What should I do if I am injured after a fall at a business? Many people have experienced the embarassment following a fall at a business. The natural response is to immediately jump up and walk away as if nothing has happened. Falls can cause serious injuries; however, and may have been caused by the negligence of a business owner or its employees. Although seemingly obvious, take a look at the ground to determine what caused you to fall. Take a picture of the foreign substance on the ground and/or your wet or soiled clothing. Insurance companies will deny after the fact that there was ever anything on the ground. They will blame your shoes or claim you were under the influence of alcohol or drugs. Make sure you fill out an incident report. If you did not prepare one at the time, return to the business to make a report. Seek medical treatment and report the cause of the fall to your doctor. Watch for additional symptoms to appear in the days following the accident. You will likely experience the most pain days after the accident. Here at Jones Wilson, LLP, we've made it our mission to defend the rights of those injured due to the negligence of others. From our office in Henderson, we're able to serve the entire Las Vegas community. If you've been injured due to a slip and fall, call us today at 702-405-6000 to schedule a free, no-obligation consultation. What types of injuries are common in slip and fall accidents? Is my injury normal? 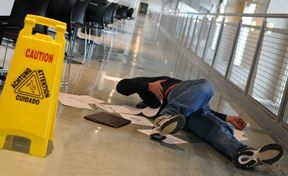 Many slip and fall accidents go unreported because the victims are embarrassed and blame themselves. Instead of recognizing the true cause of the accident, victims associate their falls with their own clumsiness. Because they believe their injuries are their own fault, the people actually responsible for the hazardous situations causing the falls are never held accountable. Other people may recognize that the fall wasn’t necessarily their fault, but figure that a twisted ankle or sprained wrist isn’t enough to warrant a public outcry or filing a lawsuit. While we can sympathize with the desire not to make a fuss over a minor injury, we think all these people are making mistakes. When injury victims reject the idea of reporting an accident or filing a claim, the hazard remains to hurt someone else, and the next person may suffer more than a few minor bruises. According to the Mayo Clinic, over 10 million people a year suffer from slip and fall injuries. The National Safety Council suggests that falling accidents are one of the leading causes of unintentional injuries in the United States and considers falls as the number one danger for people over 65 years of age. Many factors can cause accidental falls; the real danger lies in the severity of the injuries they cause. Pulled muscles and stretched tendons. Reflexes, like tensing your muscles and twisting your body in anticipation of a painful fall, can result in the overextension of tendons or the painful stretching of muscles. Sprained and broken wrists and ankles. Your common impulse when you fall is to catch yourself. Unfortunately, attempting to stabilize yourself can cause you to twist your ankles, put too much pressure on your hands, or place too much weight on delicate bones in the wrists and ankles, causing them to snap. Fractured clavicles. Falling forward can your chest into the ground. If your collarbone strikes the ground first, the impact force of the fall could cause your clavicle to shatter. Tailbone bruises or fractures. If you fall backward, the natural reaction is to extend your buttocks in order to absorb the impact on the softest part of your body. Unfortunately, the force of the fall could be so great that it travels through your tailbone, causing immense bruising and even breakage. Spinal cord injuries. Falling on your back could cause the majority of the force to be exerted on your spine. That much force could cause vertebrae to chip, nerves to become damaged, and even permanent destruction to your spinal cord itself. Head and brain injuries. Your skull is attached to your body by small bones, and when you fall on your back or your chest, your neck acts as a whip to your skull: the impact force travels up your neck and whips your skull back. This not only causes whiplash and neck injuries, but it could add additional force to your head as it strikes the ground. This force can cause skull fractures, bruising, and brain damage. When you’re injured in a slip and fall accident, no matter how severe the damage is, you deserve proper compensation for the harm done. Sadly, what you deserve isn’t always what you get. Insurance companies are very good at confusing the issues and falsely denying claims. However, we’ve got your back! Don’t allow a slip and fall injury to drag you down, especially when we’re here to help you stand and stay on your feet. A slip and fall injury has the potential to cause you severe physical and financial harm. Don’t let it! Contact us online or call us directly 866.299.0558 for a free consultation and see how our personal injury lawyers may be able to help you. We help injured victims in Henderson and Las Vegas as well as visitors who have been involved in an accident while visiting our area. According to the Christopher and Dana Reeve Foundation, 23 percent of paralysis victims suffered accidents in which their spinal cords were injured. Although a spinal injury doesn’t necessarily guarantee paralysis, any direct damage to the spinal cord can potentially cause some form of paralysis. Since your spinal cord is basically the communication center for your brain to communicate with your body, when it gets damaged, certain neurological messages which are sent to control parts of your body become lost or incapable of being sent. Likewise, messages from the body back to the brain cannot “leap the gap” of a damaged spinal cord. Depending on where the damage occurs, this can lead to different forms of paralysis. Paralysis from spinal cord injuries (SCIs) are generally classified under one of two categories: paraplegia and quadriplegia. Paraplegia and quadriplegia are both commonly referred to as paralysis. However, they are each separate forms of paralysis, characterized by the location of spinal injury. Depending upon where the initial injury occurred, symptoms of paraplegics and quadriplegics can widely differ. Paraplegics suffer from what is known as “partial” or “incomplete” paralysis, which only affects two limbs (generally the legs). This type of paralysis results from an injury to the thoracic, lumbar, or sacral regions of the spinal cord (the entirety of the spine starting below the neck). Paraplegics are usually hospitalized for up to five months for extensive rehabilitation and therapy. Depending on the extant of the injury (in cases of minor bruising or swelling), some paraplegics may regain feeling and mobility. Quadriplegics, on the other hand suffer from partial to “complete” paralysis, which can affect all four limbs (arms and legs, including hips). This type of paralysis results when damage occurs to the regions of the spine known as C-1 through C-4 (starting where the skull meets the spine and continuing down the neck). This damage causes the victim to lose both sensory and motor functions, completely disrupting sensation and control. Quadriplegics usually need at least six to eight months of extensive rehabilitation before they can be discharged from the hospital, and then continue treatment and therapy on their own. Not all spinal cord injuries are severe. In some cases, swelling can cause a temporary communication block from the brain to the nerves. As the swelling decreases, the messages slowly get through causing temporary paralysis. When you first experience a spinal cord trauma, it’s extremely difficult to determine the severity of the injury. Sometimes a simple bruise can make your legs go numb as if you’re paralyzed, while other injuries can seem minor but then develop serious complications. No matter the cause, or the initial symptoms that result, if you injure your back or neck, or feel numbness, uncontrollable muscle spasms, or signs of paralysis, you need to seek medical help immediately. Hesitating could cause the injury to worsen. After you’ve been fully examined and diagnosed by a doctor, your next plan of action should be to contact an experienced spine injury attorney. Although your body may be paralyzed, there is no reason for you to let the insurance companies take advantage of you. Allow us to have your back and fight for the financial security and the long-term treatment you need. Don’t allow an accidental mishap to destroy your financial independence or affect your mental state. Call us today for a free consultation and see how we can help you! My family constantly receives text messages and phone calls, even while we’re in the car. What can I do to keep myself and family from becoming distracted while driving? The tragic consequences and horrifying risks of phone distractions and texting while driving are constantly being shown in the news, on television, and on billboards. However, these risks are still somehow being ignored by drivers. It takes more than a second. The average text takes five seconds or more to send. The other driver was also texting, assuming that you would protect him. Instead of hoping that your phone’s distractions won’t cause you or a family member to get into a horrific accident, learn how to avoid the distraction in the first place. Not only will you reduce your risks of causing an accident, you can improve your chances of avoiding a crash caused by someone else. Although many people pride themselves in being able to do several things at once, the human brain isn’t designed to be able to put full focus on more than one thing. Sure, you can sometimes physically accomplish multiple things at once, but neither task will receive your full attention and they won’t be your best work. It’s even worse when your mental concentration is critical. Imagine you’re talking on the phone and reading a book. After two minutes, can you recite what you just read as well as what your conversation was about, or are you going to have to reread that paragraph? Multitasking is a lie. When your mind becomes distracted, it can’t focus on everything that is happening around you. In some cases this is fine: forgetting to put the mayonnaise on your sandwich because you were also watching the television isn’t going to kill you. But forgetting to stop at a stop sign because you’re texting may indeed be fatal to you or a pedestrian. Driving requires your full attention and focus in order to recognize and respond to potential dangers. However, when you try to sneak in a text or respond to an email, that attention is diverted, causing you to lose focus and put you and your family at risk. This is why it is extremely important to not only understand these risks but also learn how to avoid the distraction before it gets to the point of causing harm. The safest thing to do with your phone, tablet, or any other distracting electronic device is to keep it turned off while you’re driving. Unfortunately, in today’s society many people believe that their phones must be on at all times in case someone has to reach them. Although this may be practical when at work, home, or a party, that just doesn’t work while driving. Fortunately, for those drivers who feel that they must be reachable at all times, there are safer methods of texting, talking, and communicating without the need to physically hold a phone or take their eyes from the road. Although these methods give the driver better control over their vehicles, talking can still be distracting. When using these methods, make sure that you keep it short and focus on the road ahead, rather than a response you give. Automatic messaging responders. These particular apps respond with an automated message whenever you can't make it to the phone. You can turn the app on before you get behind the wheel, and if you receive any texts, it'll respond to the sender with whatever you program it to say—for instance, “I can't respond right now; I'm driving. I'll get back to you as soon as I get out of the car." Silence or vibrate mode. If you can’t ignore the sound of a text coming in, put your phone on silent, vibrate, or turn it off completely so you’re not tempted to respond. Cinema mode. Some cinema mode apps will not only automatically silence your phone but will also dim your screen, so you won’t know you received a message until you have stopped safely. Voice-to-text apps. VTT apps allow you to speak a message and send it via text messaging without the need to type. For example, Siri can be used on most iPhones. Knowing your options for decreasing your phone distractions is regrettably only half the battle. Although you are now equipped with the knowledge you need to protect your passengers from your own temptations, the unfortunate truth is that other distracted drivers can’t be trusted to drive safely. Help us raise awareness about cell phone driving use and encourage your friends and family to put down their distractions. Share this page on Facebook, Twitter and Google+ to show your support for stopping driver distractions. Together, we can help decrease texting and cell phone accidents, and make our roads a safer place to travel. Please, share now. Need more information on car accident injuries or claims? Contact us today for a free consultation, and like us on Facebook for periodic updates and advice. In many personal injury situations the obvious response is to act quickly. Even if you think you have lots of time to consider your alternatives, deadlines sneak up on you and personal injury lawyers need time to prepare. If you wait to talk to a personal injury lawyer, you may do things that could hurt your claim without even knowing. Insurance companies often rely on you to submit information. If you don’t know when to submit that information, they may withhold money from you. Your Vegas Lawyers always recommend looking for a personal injury lawyer sooner rather than later. If you’ve suffered an injury due to an accident, keep in mind that time limits exist on your right to file a lawsuit. These “statutes of limitation” vary greatly from state to state and depend upon the facts and type of each case. In some instances, the law requires a claimant to notify potential defendants about any injury within an extremely short period of time – as little as a few weeks or months. If you sit on your personal injury rights, you could lose them. You might have been angry about an accident and the pain you have felt following that accident, but if you wait too long to obtain medical attention, the insurance carrier is going to deny you were ever injured in the first place.